The world's best phonics reading program! ClickN READ Phonics teaches the entire Pre-kindergarten to 3rd grade phonics curriculum taught at USA public schools through 100 interactive cartoon animated online phonics lessons. Children learn english correctly in a phonics game-like environment that is great fun and easy to use. You can be assured that you are purchasing the world's most effective reading program because the research based phonics curriculum is designed by nationally recognized research professor Dr. J. Ron Nelson. All other learning to read programs are simply toys when compared to ClickN READ Phonics. Our phonics program is designed for children as young as 4 years old learning to read English for the first time, older children struggling to learn to read, learning disabled children and even adults learning English as a second language. ClickN SPELL is a research based spelling program for PreK through 5th grade that teaches the 800 most commonly used words in the English language. The program may also be used as an intervention curriculum for struggling spellers regardless of age or grade level. Mastering this list of words has been proven to be very successful in mastering English. For example, the most commonly spoken 800 words are used 13 times more frequently than the next most common 800 words. ClickN SPELL therefore provides a solid foundation not just for spelling, but also for the English language in general. . Authored by nationally recognized research professor, Dr. J. Ron Nelson author of our award winning ClickN READ Phonics program, we again offer the most powerful teaching tool of its kind. The unique instructional design used in ClickN SPELL makes spelling more fun and more effective than ever before. The ONLY Programs Guaranteed to teach your child to read and spell. Complete all 100 ClickN READ Phonics lessons and if you are not satisfied that your child has learned to read, we will refund your money. Complete all 100 ClickN SPELL lessons and if you are not satisfied that your child has learned to read, we will refund your money. This guarantee applies to both homes and schools as well as children with learning disabilities and adults! NO TIME LIMIT! 60 Day No Questions Asked Refund Policy! Should you ask for a refund within 60 days of your purchase we will not ask questions! Simply send us an email for an immediate 100% refund, regardless of how many lesson plans you have completed. Every single click that the child enters while completing all 100 lessons are saved on our computer systems. Combined with the extensive instruction in the program and the fact that answers are never "given away", our progress reports show you a level of precision not found in any other phonics reading program! This Cumulative Report includes results for all 100 spelling lessons. For each lesson the percentage represents the percentage of the spelling words in that lesson that the student spelled correctly on the first attempt. 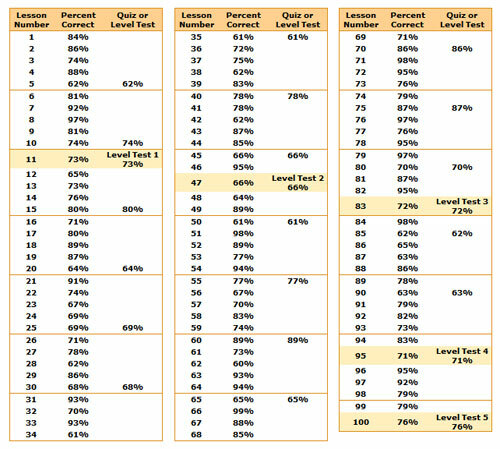 The column "Quiz or Level Test" shows the scores for quizzes which appear in every 5th lesson and level tests which appear in the last lesson of each level. 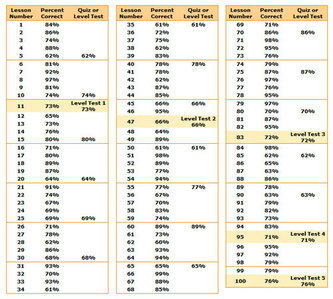 Scores below 80% are lessons that should be repeated. Also, detailed recommendations are provided at the end of each lesson if a lesson should be repeated or not before moving on. For School Accounts: Two additional columns with lesson scores and quiz/level test scores are provided to determine average scores for your class as whole. The owner of this site is an authorised distributor for ClickN Kids Inc.